Typical failures that CnW Recovery will solve are disks that are not closed properly, previous partitions not imported, or UDF disks that were not completed. Disks that have sector failures will also be read by a very tolerant recovery routine. There are two main operating modes for CDs, ISO9660 and variations, and UDF. Both allow for data to be added, which also means that while adding it is possible to lose previously written data. The other variation is that both media types come as write once, or Read/Write. R/W media has more scope for corrupting, and loosing data, and so if often the subject of data recovery. When the restore button is pressed for a CD, the following screen is displayed. The top line of options should be selected automatically by the program, but can be overridden if required. ISO9660 and Joliet are almost identical, except for the fact that Joliet have more friendly file names. This is achieved by having a second parallel directory structure on the disk. If either directory has become corrupted, the other may assist in data recovery. UDF format can be used on both Read only (CD-ROM) or Read Write, CD-RW. With CD-RW, most modern disk drives support Mount Rainer logic to take care of sector failure. This a method where 39 sectors are used to record 32 sectors of data, and so failed sectors can be reallocated. To the user this is invisible and the option on this software will only be required when trying to read a Mount Rainier disk with a non Mount Rainer drive. CDs and DVDs often fail with a CRC error. CnW Recovery software will continue trying to read the file even after such an error. The failed sector will be padded. For some files this will cause corruption, but for others a single sector error may go unnoticed. For instance, for a jpeg photo, a failed sector near the end of the file will only make a small corruption, though an early sector may cause significant corruption. The CnW software does try several read attempts before ‘giving up’. With random CRC errors, it is often worth while trying the CD / DVD on a different physical drive. 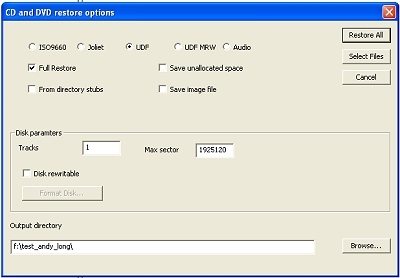 CnW Recovery software has being developed so that it will recover files from CD-RW disks that have been quick erased. This has been extremely successful, but can still be a bit tricky to use - using standard drives. If you have the requirement to recover from quick erased CD-RWs, please contact CnW Recover info@cnwrecovery.com for further assistance. Or, for a fixed fee of £30 CnW provide a service to read quick erased CD-RW, and £40 for quick erased DVD-RW. Some companies claim that recovery from a Quick Erased disk is not possible, CnW Recovery have often proved that it is possible. Download the demo now and you will see files that can be recovered. The wizard will walk you through the processes, or advanced tools can be used. A full log of all files will be produced.